WooCommerce, without any doubt, is the most complete and powerful open-source e-commerce plugin ever developed for WordPress. One of the most important reasons for WooCommerce success is its flexibility and the ease of customization, there’s an API for nearly everything that lets you easily convert a WordPress site into an amazing online store. When selling online, information is the key. So you may wish to display extra information that gives your customers the details they’re after and sometimes it might not be possible to provide information using the default available fields, in that situation the best method would be creating custom fields to store that extra information and make available to customers. In this tutorial, I decided to show you how you can add custom fields to WooCommerce products without using any plugins. As apparent from the above screenshot, we will add custom fields to the WooCommerce product edit screen under the General tab. We will be working on the file functions.php (default location to add custom function) of your theme folder. The first step is to using the right hook. There are certain WooCommerce product options hook like below. In this tutorial, we will be using the woocommerce_product_options_general_product_data action hook. If you want to add your fields to any other tab than the general one, simply modify the hook name. The callback function(below) linked to the above hook will be responsible for the newly created custom fields under the General tab. There are various functions available in WooCommerce to add different types of inputs fields. The callback function simply use any one of the input type function with respective argument values(id, type, label, description, desc_tip, laceholder) for registering fields. There are many other supported input types such as tel, email, number and you can add those using woocommerce_wp_text_input() with mentioning the ‘type’ value. Please note that, esc_attr() and esc_html() are used to secure data. Ok, great, you are done with creating fields and saving their values. you just need to use the WordPress function – get_post_meta(). Finally, you’ve learned how to add WooCommerce custom fields to add more information to your products by editing the product page template. 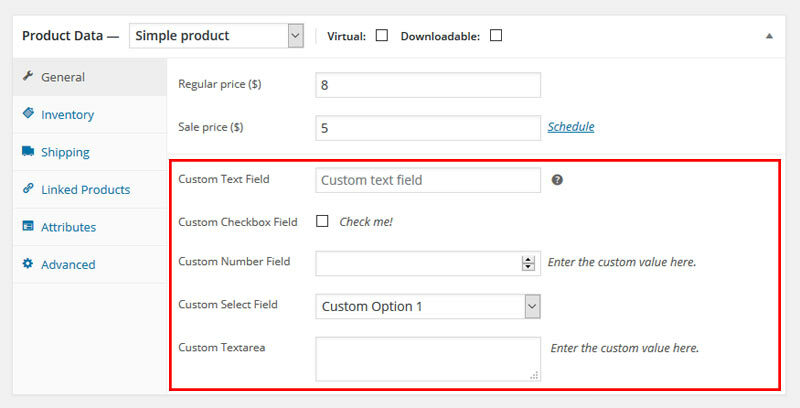 If you’re looking for a method to create and show WooCommerce custom fields without coding, check out this non-technical tutorial. Thank you for reading, I hope you find this useful. Don’t forget to share this via social media, who knows someone else might be looking for this. Hey. Thanks a ton for the example, it helped me a lot! One thing though, by using !empty($field) when saving data, you are making it impossible to delete a value from the field. Like when you want to clear the field and revert it to nothing. This can be solved by removing the !empty() function. I haven’t run into any issues without that fallback yet. Is there a way I can display the added custom field values in the additional information tab alding with other product attributes. DJ, you can use the information found here: https://docs.woocommerce.com/document/editing-product-data-tabs/ along with the information found under the “How to access WooCommerce fields Values” in this article. Just change the “custom-field-slug” to your field. Hope that helps! Hi, I’m attempting to use this code however I’m having trouble retrieving and displaying the value of a custom text field on the front end. If I create a custom Text Field labelled “Area Code” can you confirm what I need to change the “custom-field-slug” to. Thanks for this, that’s a really good technique. I’ve published a non-technical tutorial on how to ad custom fields to WooCommerce products and display them on your website, which any non-coders reading this might be interested in. You can find this at: https://barn2.co.uk/woocommerce-custom-fields-taxonomies. i want to add custom global product tab just like additional info when a new product is created.I am able to create new tab but cannot find update anything on create new product page.I can see it on display page but how to add info through product edit page.I know i can use custom fields but looking to have it on product page so that shop manager or others can do it without adding custom field but just like they fill additional info. May be this code is bit different.. Thanks for this, that’s a really good, and now i can create new field in my product..
Hi Roy, thanks for the tutorial. Suppose if the woocommerce plugin got updated to the latest version, do these files we have updated with custom code get overwrite? Proy’s blogs has a great experience in wordpress custom coding. it help me in various ways. it’s really such a great station to stay for wp coding. This post was brilliant – I was able to copy the sections I needed (I added a checkbox to the General tab and check it in post_class filter). Do you have a mailing list or are you on twitter? 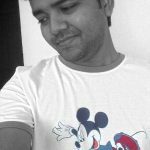 I’d love to get notified of new posts – I enjoy learning more about WooCommerce and CMB2 (I’m moving from ACF to CMB2). I’m new in woocommerce and i don’t have knowledge in php too, all above steps (i mean all code you hve created) should be added in function.php file? Hi, thanks for you post. How can I alter this to show my custom fields depending on which Product Type is selected (variable, simple etc)? I’m not sure what I skipped or need to change, but nothing shows up on the front end. I have copied the code, and it works fine on the back end. I’ve followed your instructions, and it works great on the back end, however, nothing shows up on the front end. Any suggestion on what to do? Also, I need to add multiple text fields. How do I do that? what is ‘custom-field-slug’. i need to display the value in woocommerce order email also. please help. I am not understand what is “custom-field-slug”. For everyone wondering what custom-field-slug is. It’s the id you give to the input. Is there a way to display custom product filed to a product list admin area. For example next to SKU column. I would like to add UPC number and to be able to search it. I am trying the code to achieve displaying the custom fields in the additional tab where I have changed the additional tab to specifications. I can achieve the entry from there on the advanced tab but the final result is not getting displayed on the frontend. Please help me suggesting where I am doing mistake achieving it, is it the slug?